Now, here’s a controversial one. Robert A. Heinlein’s most famous novel has nearly always divided opinion. Winner of science fiction writing awards, criticised for a militaristic, fascist endorsing tone, endorsed by large parts of the US military, Starship Troopers, with its history, is a very singular book. Nominally the story of Johnny Rico and his military service in a distant Earth wide federation, Heinlein’s book is, in reality, a deeper treatise on a variety of themes – military service, personal responsibility and the moral use of force. The first thing to say is that Starship Troopers was always, in my estimation, a really terrible science fiction book. The actual sci-fi plot, involving an interstellar war against giant insects, always seemed very thrown together and shallow to me. In truth, I always looked at Starship Troopers in a different way. For me, it was simply a collection of essays by the author on the above mentioned themes, that he carelessly wrapped around something that I wouldn’t even consider good enough for a Power Rangers plot. No, Starship Troopers is better viewed with the “bugs” stripped away. If you do that, it becomes an altogether more interesting experience. I wouldn’t claim to believe or endorse everything that Heinlein writes here, but it at least got me thinking about certain topics in a way that I hadn’t before. He was writing from his own military, naval, background, and his thinking permeates every part of the text. The main character is the intended recipient and author of numerous monologues or lengthy thought processes, which serve as the medium for Heinlein to elaborate on his ideas. For him, force, as in physical violence through the cipher of warfare, is the ultimate power in the world and in human existence, the practice that has had the greatest impact on our species and our activities. I would personally disagree, but Heinlein makes the case in as emphatic and persuasive a style as any author I have ever read on the subject. The rejection of war as a means to solve problems is a dangerous thought to Heinlein, one that gives too much credence to negotiation and trust – instead, better to embrace the power that war has to settle disputes and problems, through “naked force”. While I disagree with this conclusion, reading Heinlein helped to formulate my own line of thought, which embraces the author warnings that, to ignore the practical applications of violence out of an idealistic streak is foolish, even if single-mindedly pursuing military means to solve an issue is the same thing on the opposite end of the scale. On ideas and theories that I supported, I was intrigued by Heinlein’s thoughts on military service. For Heinlein, the normal members of society, whether it was the 1950s America he was writing in or the future Terran Federation of his imagination, suffered from a critical lack of civic responsibility. Heinlein theorised that people who seek to frame the way that their government works through active participation in politics need to first understand what it takes to protect such institutions and the freedoms that they provide, by placing their own lives on the line through military service, the difference between a citizen and a resident. The Terran Federation is a place where individual sacrifice brings social responsibility, leading to the creation of a functioning meritocracy. An interesting idea, to be sure. While I would never advocate the creation of such a system today, it was since reading Heinlein’s words on the topic that I became interested in what we call “national service”, and how such a thing can and could lead to greater privileges for citizens of a modern democracy. Imagine a system, a completely voluntary one, where, once you sign up for so many years service (not necessarily military), guaranteed to be given something to do, you receive paid college education, preference for public jobs, tax incentives and any other perks that could conceivably be made possible in the future. I’m rambling off the point here, but I will re-iterate that it was Heinlein’s work that first got me thinking about such ideas, and how personal responsibility is important for democracy to function – it is not enough to simply vote and forget, since such an attitude cheapens the very institution that it sustains. The point is that democracy and the franchise should be seen as valuable. But back on the issue of war and the military. Beyond the deeper thoughts that Heinlein offers, this is still a searing and in-depth tale of a man who seeks to make something more out of himself, to defy the expectations of his elders and find something worth doing with his life. Like so many others before him, he chooses the military. Starship Troopers is a brilliant and resolute re-telling of such an experience, from the earliest inklings of military expectation, though the brutal life of boot camp training, to the first tastes and terror of combat, and finally to the assumption of a leadership role. I found Heinlein’s tale to be as enthralling an account of such things as any other, with a gift for capturing the internal thought process of the soldier as he evolves from recruit to officer. And it is also a great depiction of the military world in general. Rico deals with various different facets of drill sergeants, the creation of the regimental spirit, the military attitude to trial and punishment, military incompetence in war, the failure of bureaucracy, veterans affairs and the key skill of adaptation when it comes to fighting, both it terms of how you fight and in organising yourself to fight. There are only two battle scenes to note, and Starship Troopers makes it clear that military life is often one of long stretches of monotony, training and frustration, marked out by brief moments of violence and fear. But isn’t Starship Troopers overly militaristic? It is a common criticism levelled, and there is some truth to it. While making clear that he see’s non-military means to get to the point of being a functioning citizen of a democracy, Heinlein does spend most of his time discussing the ways of getting there militarily. For someone accused of being too militaristic and belligerent in the suggested use of force, the above passage is remarkably conservative. The term “purposeful violence” in particular struck me as a potent phrase to describe the applications of military power – never for its own sake and always in pursuit of a larger objective. What did Starship Troopers teach me about war? More than anything I have already mentioned, it made me think about some things, some constants, that I had not previously thought about or tested sufficiently, and thus also aided me in coming to my own opinions. I don’t believe fully in Heinlein’s meritocracy, or Colonel Dubois’ forceful declaration on the use and morality of force. But their words and thoughts helped to shape and form my own, which is not something that many books actually do for me. 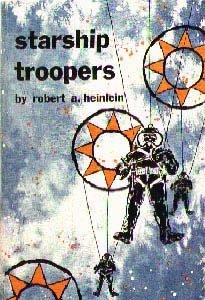 In-between monologues on the nature of civilian responsibility, thoughts on the recruiting and training of soldiers and the very nature of war, Heinlein challenges the reader and makes some thought provoking arguments. For no other reason, I think that it deserves its place here. This entry was posted in Books, NFB Reading List, Reviews, War and tagged books, bugs, heinlein, reading list, reviews, rico, starship troopers, war. Bookmark the permalink. Your quote near the end (Heinlein’s views on grand strategy) was strikingly similar to what I remember of Clausewitz’s On War (war as policy by other means). Haven’t actually read Starship Troopers, I’ll be sure to check it out. Since you reviewed Dispatches recently, have you had the opportunity to read Street Without Joy? I would say that Clausewitz, especially the passage you are referring to, was a fairly big inspiration, considering that, Heinlein would almost certainly have read On War during his time in the Navy (or before). No, I haven’t read that one, although at some point I will be including The Last Valley, which covers a different aspect of the same general subject area. Edit: To clarify, that would be Martin Windrow’s “The Last Valley” on the siege of Dien Bien Phu, not the Fick novel on the Thirty Years War.